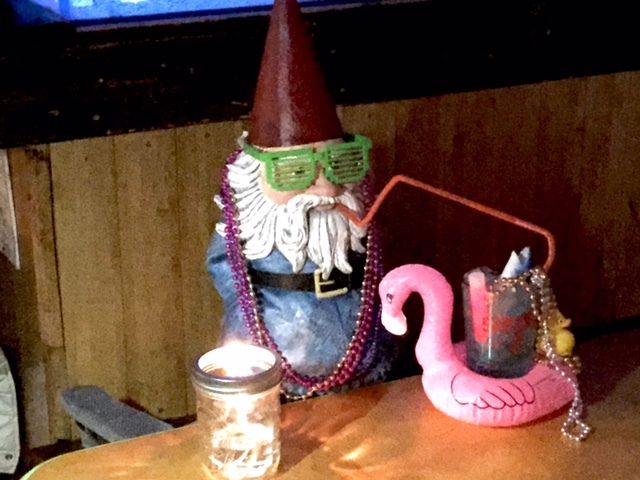 A couple weeks ago, we got word that the Roaming Gnome—a lawn ornament that some joker at Travelocity turned into a globe-trotting quasi-celebrity—would be visiting Lawrence for College GameDay with ESPN. We get excited about pretty much anything that is 1.) silly, and 2.) 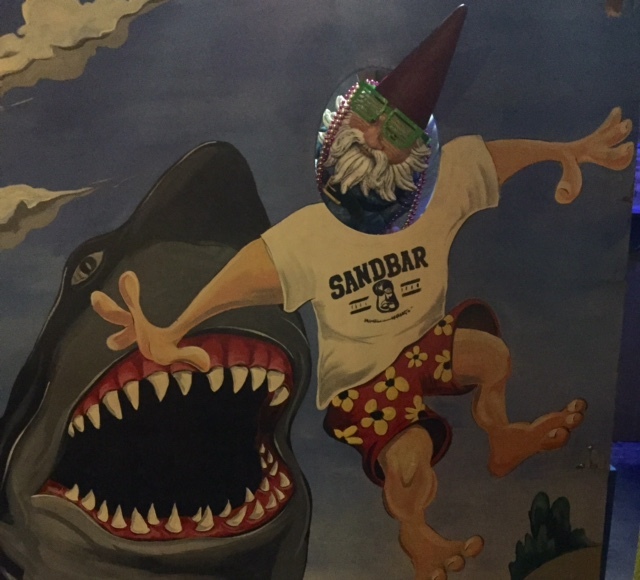 an opportunity to take silly pictures, so we were thrilled to find out that the Sandbar made the cut as a stop on the Gnome’s itinerary. 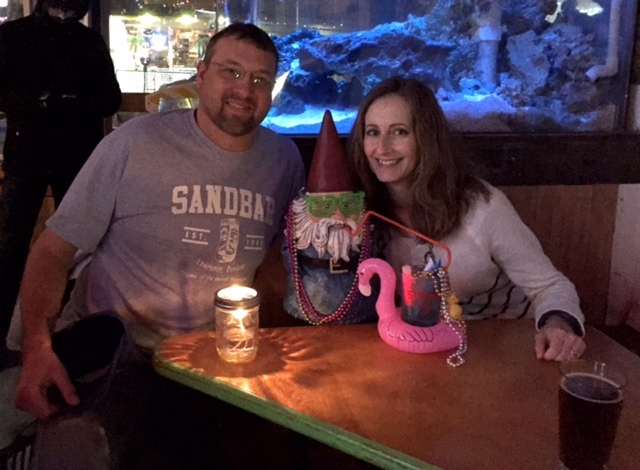 So, on February 28, after spending part of the day on the KU campus followed by dinner at local favorite Free State Brewery, the Gnome and his handlers arrived at the Sandbar. Of course he experienced everything we have to offer: a Shark Attack, a photo opp with the shark outside our door, dancing on the bar and an indoor hurricane, complete with napkins flying through the air. Thanks, little buddy, for hanging out with us on a chilly Thursday night. We hope you had fun, come back soon! 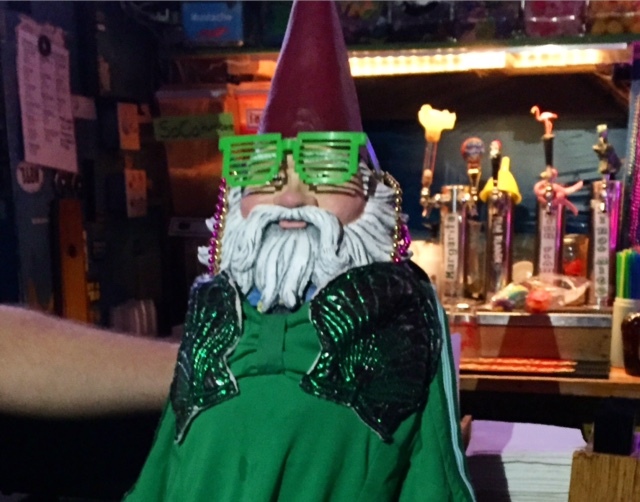 The folks at Travelocity made this fun video recapping the Roaming Gnome’s time in Kansas. He also visited Wichita State University for their College GameDay appearance, which was the same day as KU’s. Rob Riggle, famous comedian, actor, Marine and KU alumnus, tended bar here while he was going to school in the early 90’s. Anyway, we were excited to hear Rob give us a great shoutout recently during an interview on 810 Sports radio show last week. You can listen to the interview here. He mentions the Sandbar (and the Wheel) at around the 12:37 mark. Rob was also back in town a few weeks ago for a KU basketball game, and after spending some time at the Wheel, he ventured our way. After signing the wall, he admitted to Dave that perhaps his message would have been better left in the ladies’ room instead. Probably. While typically we paint over stuff people write on our walls (so please don’t do it! ), we’re going to leave this one up. In fact, Dave’s already put a frame around it.